Hi…. and what exactly is up at I Have a Notion? Our rainfall and snowfall amounts are up in Kentucky. Almost 3 times more snow than was predicted… and if we get too much more rain… we will float away. Also up are the wild Hyacinths. These pop up every year in the lawn, and they are naturalizing. The first year here we only had 2 or 3 plants and now we have 20! I love them. We also have lots of wild violets… under the maple and just to prove its spring… even if the temperatures don’t say so, the dandelions are blooming too. This little one is up to 1 month old! I spent a day last week with her. It shot the whole day… by the time I drove up, we had lunch, a quick spin around IKEA, and the drive home… But well worth it! And another day I drove up to Louisville to drop something off for Goldie. To be tested. I took Goldie with me… for some more experience riding in the car and to get a weight. That is also up! Can you believe that in the 4 weeks since diagnosis… she gained 15 pounds!!! The C-diff is done! and we are working on the Crypto. Hopefully one more sample…. and we will be in the clear. And just like the rest of America… some of this! and it is taking more than one day! What has kept you busy? Sewing or Taxes or….? Today is Worldwide Quilting Day! I hope you have set aside some time today to do something Quilty to Celebrate! When I lived in Nebraska, we always had a Soup and Sew Day sponsored by the guild. To build and cement our Quilting Life and Friendships. It was always a big deal since the National Quilt Museum is in Lincoln Nebraska! I celebrated a few days early, and unfortunately, no pictures!!! I did a presentation on thread for the Kentuckiana Longarm Guild I belong to. Based on that presentation, I was asked if I would come and share it with a Guild in Indiana. 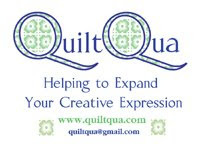 Our date was set, and I ventured up to Indiana on Thursday afternoon to share my quilts and some thread information in the evening with the Washington County Quilt Guild. I had such a great time sharing some of what I have been working on the last few years!!! So while I may not make it into the Creative Spaces today… I did spend some Quality Time this week with Quilts and Quilters!!! So how are You celebrating “National Quilting Day”? So what is new in Goldie's world. Quick snap… of Goldie 7 months!!! We think she is on the mend! After the last test for Giardia came back positive I whisked her off to a visit with specialist. Required a drive up to Louisville with Goldie. Due to miscommunication, it required a second trip the next day to deliver a sample. Took about a week to get the full panel of results back. But we got an answer. Her lower GI track was compromised. She had Cryptosporidium and Clostridium Difficile (C-diff). Poor girl. Both were causing her problems. So a bag of Hydrolyzed dog food (to also rule out a food allergy) another script of Panacur and a script of an antibiotic, (fortunately sprinkled over food but needed to be dosed every 8 hours). We saw some immediate improvements. She has been gaining weight and growing, now that she can absorb some nutrients. We send in another sample… and hopefully we will be done…. but will have to keep her on a tight lead until we can use some bleach in the yard. C-diff stays in the environment for a very long time. Where did she pick it up? I suspect at the vets office when we went in for her regular course of vaccinations or for the Giardia. She had not left the house or yard since we brought her home. I feel strongly about taking puppies out before they are fully vaccinated and it was just too darn cold to go outside. Too easy to pick something up…. and she did!!! A little side business this past week. On Wednesday…. I had a FB Chat message…almost didn’t read it…. but really glad I did. My sister… lives far away in Nebraska and was just up the road in Indiana last week for the birth of a grandchild. I drove up the following day to visit with sister, niece and great niece for a few hours. All was well. Sister flew back home, niece and baby went home. Wednesday morning Chat Message from sister- C is back in the hospital, a lot of pain. She can’t be alone with the baby in the room. Can I go? It is 5:30 am… and I haven’t had coffee. Message back coffee and a shower and I’ll be on my way. Dressed and packed some clothes for a few days… collected electronic backup/charging stuff and was in the hospital by 9:30 am. So what did I mostly do? Such hard work for me!!! however by doing this… mom got to rest, really rest and recover and go home yesterday from the hospital yesterday. The Grampa flew in from Missouri…. as I was leaving. But I think I will plan a little trip up… in a couple of weeks just to check in! Needless to say….not too much else got done!!! Another left turn, but a fairly pleasant one, since everything turned out well in the end. Do you have detours that while not in the plan are so rewarding and well worth the change of direction?